Tyres - Hero MotoCorp Ltd. The tyres that are fitted on your motorcycle are designed to match the performance capabilities of your motorcycle and provide the best combination of handling, braking, durability and comfort. To safely operate your motorcycle, the tyres must be of recommended type and size, in good conditon with adequate tread, and correctly inflated. Properly inflated tyres provide the best combination of handling, tread life and riding comfort. Generally, under inflated tyres wear unevenly, adversely affect handling, and are more likely to fail from being overheated.Under inflated tyres can also cause wheel damage in rocky terrain. Over inflated tyres make your motorcycle ride more harshly, are more prone to damage from surface hazards, and wear unevenly.Make sure the valve stem caps are secure. If necessary, install a new cap. Over inflation / under inflation will affect the performance. Whenever you check the tyre pressure, you should also examine tyre treads & side walls for wear, damage 7 foreign objects. Bumps or bulges in the side of the tyre or the tread. Replece the tyre if you find any bumps or bulges. Cuts, splits or cracks in the tyre. If you hit a pothole or hard object, pull to the side of the road as soon as you safely can and carefully inspect the tyres for damage. Replace tyres immediately when the wear indicator appears on the tyre. Check the tread wear indicator for tyre wear. Ensure the arrow mark on the tyre is in the same direction as that of forward rotation of the wheel, whenever the tyre is removed and put back in case of puncture. Using tyres that are excessively worn or improperly inflated can cause a crash in which you can be seriously hurt or killed. Operation with excessively worn tyres is hazardous and will adversely affect traction and handling. Follow all instructions in this owner’s manual regarding tyre inflation and maintenance. Under-inflation may result in the tyre slipping on or tyre coming off the rim. The tyres fitted on your motorcycles are of TUBELESS type. To safely operate your motorcycle, your tyres must be of the proper type and size, in good condition with adequate tread, and correctly inflated for the load you are carrying. The following pages give more detailed information on how and when to check the air pressure, how to inspect your tyres for damage and what to do when your tyres need to be repaired or replaced. Using tyres that are excessively worn or improperly inflated can cause a crash in which you can be seriously hurt or killed.Follow all instructions in this owner's manual regarding tyres inflation and maintenance. Keeping your tyres properly inflated provides the best combination of handling, tread life and riding comfort. Generally, under-inflated tyres wear unevenly, adversely affect handling and are more likely to fail from being overheated. Over-inflated tyres make your motorcycle ride harshly, are more prone to damage from road hazards, and wear unevenly. We recommend that you visually check your tyres before every ride and use a gauge to measure air pressure at least once a month or any time you think the tyres pressure might be low. Tubeless tyres have some self-sealing ability if they are punctured. However, because leakage is often very slow, you should look closely for punctures whenever a tyre is not fully inflated. Always check air pressure when your tyres are "cold" - when the motorcycle has been parked for at least three hours. If you check air pressure when your tyres are "warm" - when the motorcycle has been ridden for even a few kms - the readings will be higher than if the tyres were "cold". This is normal, so do not let air out of the tyres to match the recommended cold air pressures given below. If you do, the tyres will be under-inflated. Whenever you check the tyre pressure, you should also examine tyre treads & side walls for wear, damage & foreign objects. Bumps or bulges in the side of the tyre or the tread. Replace the tyre if you find any bumps or bulges. Cuts, splits or cracks in the tyre. Replace the tyre if you can see fabric or cord. 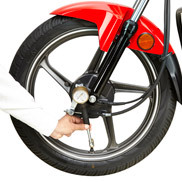 Carefully inspect the tyres for any damage, if the motorcycle hits a pothole or hard object. Replace tyres immediately when the wear indicatorappears on the tyre. Check the tread wear indicator for tyre wear. Whenever the tyre is removed and put back in case of puncture, ensure the arrow mark on the tyre is in the same direction as that of forward rotation of wheel. Always use the size and type of tyres recommended in this owner's manual. For repair and replacement of tyre it is advised to visit your Authorised Hero MotoCorp workshop. Do not install a tube inside a tubeless tyre on this motorcycle. Excessive heat buildup can cause the tube to burst. Use only tubeless tyres on this motorcycle. The rims are designed for tubeless tyres, and during hard acceleration or braking, a tube-type tyre could slip on the rim and cause the tyre to rapidly deflate. 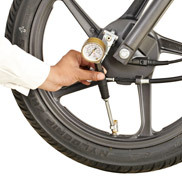 Tube with Puncture Endurance is a genuine part specially designed for the tyre of your scooter. See the following drawings for the "Tube with Puncture Endurance" structure. It has a "fluid chamber" filled with a special fluid at the ground side of the tube as shown. When a sharp object such as a nail etc. pierces into the tyre, fluid is pushed out by the air pressure plugging up the hole with the fiber in the fluid. Thus, the “Tube with Puncture Endurance” is designed to minimize air leakage. Tube with Puncture Endurance is not designed to prevent every puncture damage of the tube Use the Tube with Puncture Endurance on the scooter equipped with the genuine tyres. 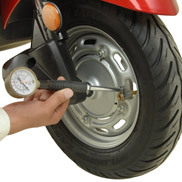 Note that the Tube with Puncture Endurance are available in every size, which are designated for the tyres of the corresponding size respectively. Do not use the tube in combination with the tyre of the different size. The Tube with Puncture Endurance is structured to be tough against air leakage when a sharp object pierces into the tyre. Note that a foreign material can get stuck into the tyre no matter the tyre pressure may look to be normal. Remove the foreign material from the tyre when it is found during the daily check and repair the tube as soon as possible. When the rim or tyre is wet with the fluid or when the tyre pressure is low, check the tyre for a foreign material and remove it. Repair the tube immediately. The fluid can come out when removing the foreign material from the tyre. Take care not to get the fluid on you. The damage that can be repaired is up to 3 mm in size. When the damage is larger than 3 mm, replace the tube. When replacing the tyre, select the new tube of the same size. Use the tube with the specified air pressure. Wash out the fluid thoroughly with water when it gets on your skin or in your eyes and get the medical attention promptly. (3) Damaged or rubbed with a rusted nail, etc. (5) Damages resulted from neglect of the above note.